Post 7 of a series detailing our trip around South America. View the series so far here. As the highest administrative capital in the world, the Bolivian city of La Paz is best known for its uniquely vertiginous cityscape in which houses stack up along steep mountain sides. Its main attraction is the vast network of cable cars that take you over and between its various planes, providing spectacular views on a clear day. 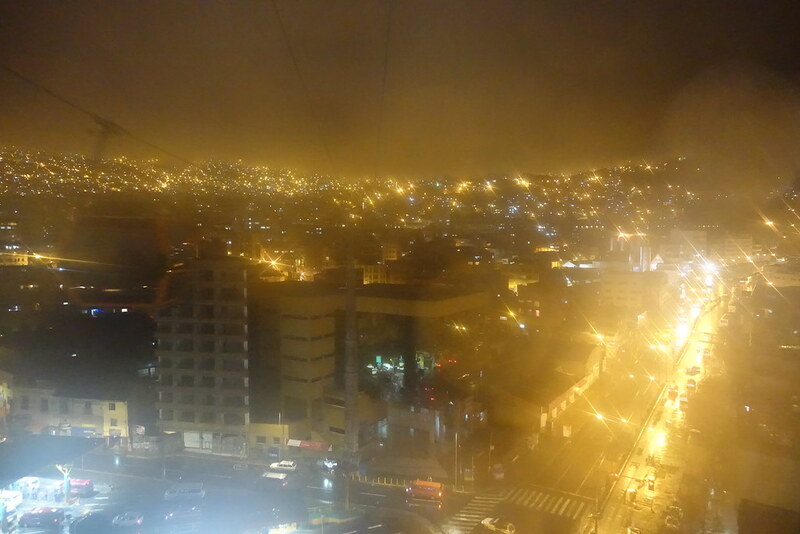 Sadly, during our 24 hours in La Paz the weather was not on our side! When we woke up in Hostal Perla Negra, the weather outside our window was terrible: wet, grey, and bitterly cold. We ate the very basic breakfast of jam and bread provided by the hotel then sheltered in our warm and dry room for as long as we could. 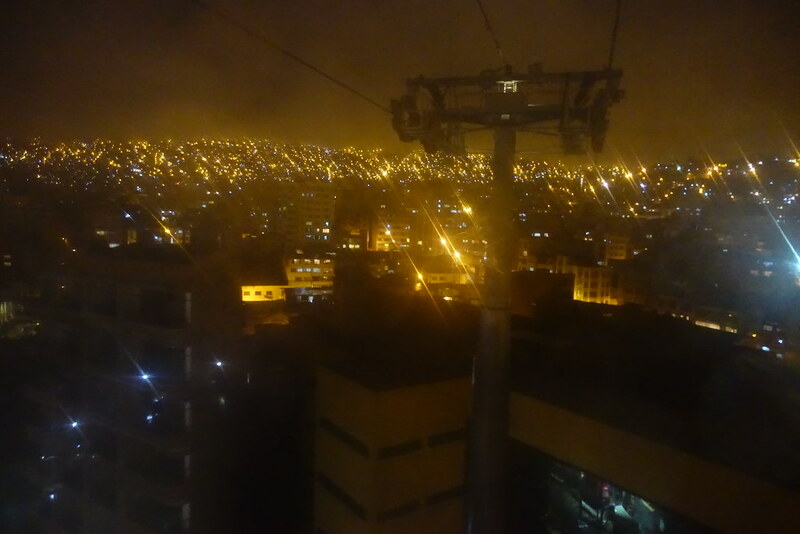 When we eventually checked out at 11.30am, the first thing we did was ride the cable car (called ‘Mi Teleferico’) from the orange station near us to the highest-up red station, Jach’a Qhathu 16 de Julio. Our intention was to get the best birds-eye view of the city – what we got was an endless, inpenetrable sea of driving rain and thick white fog! 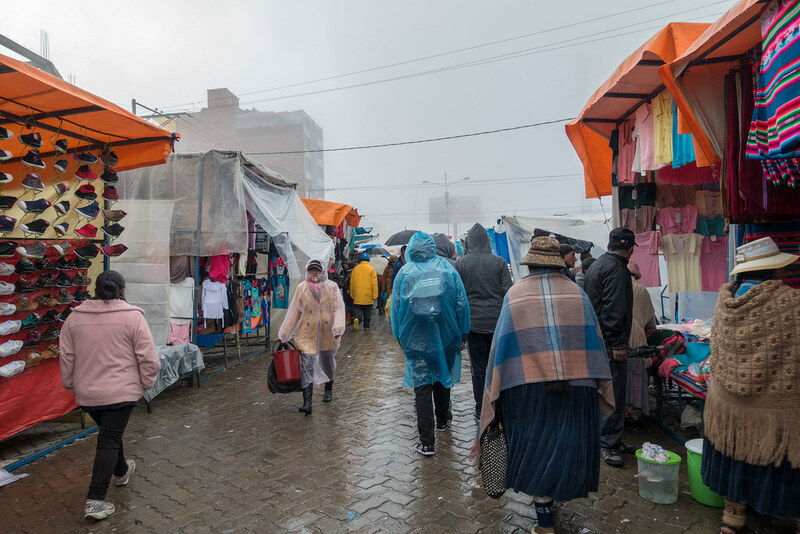 There was a large local market set up outside the Jach’a Qhathu cable car station, so despite the rain we decided to wander for a while. I was amazed at how far the market stretched, offering everything from baby clothes to car exhausts. We took the cable car back down alongside an Australian woman who told us she’d just rode her motorcycle here across the salt flats. Unsurprisingly, she said it had been very hard-going! She said she was going to a Cholita wrestling match that night, where the wrestlers are women dressed in traditional full skirts and bowler hats. I wish we could have joined her, but we had to catch our sleeper bus to Uyuni that night. 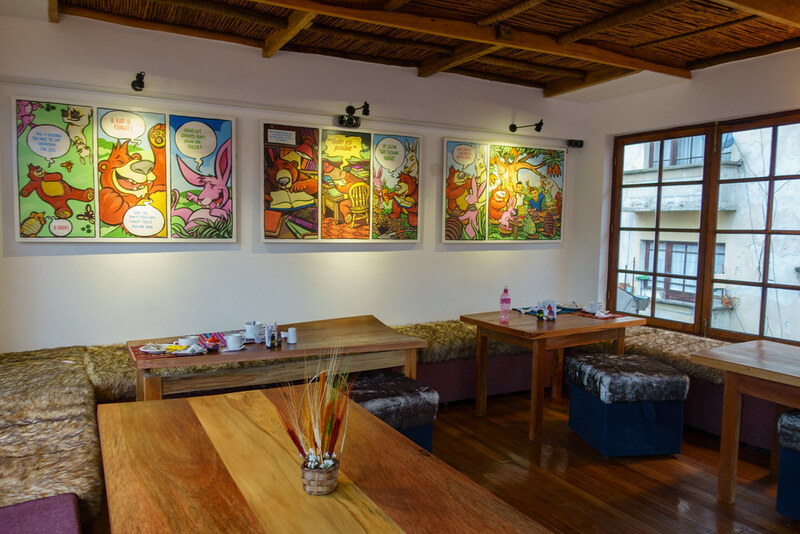 We found shelter from the rain and the cold in The Carrot Tree, a hip cafe for breakfast, brunch and lunch. 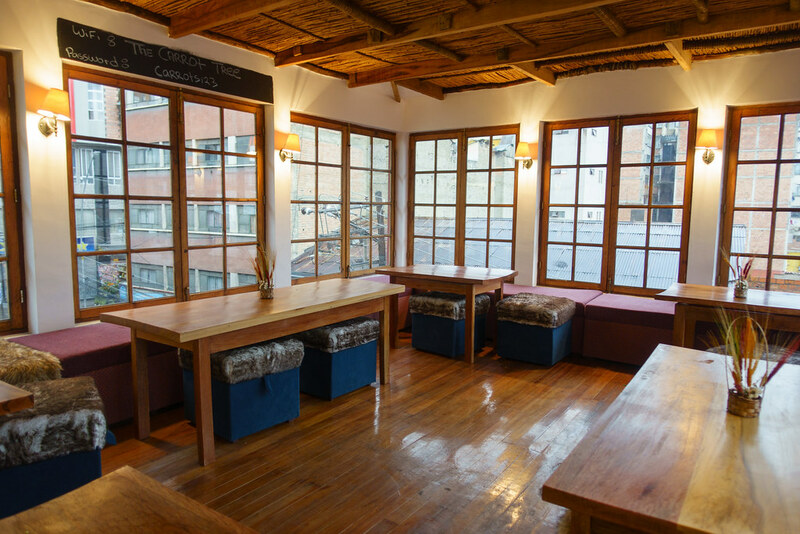 The friendly staff member who greeted us led us to an attic room where the seats were covered in large furry cushions, and even brought us a portable heater to sit beside our table! Lunch was delicious, and an absolute bargain. I ordered the three-course set menu for just 44 bolivianos (equivalent to just £4.90!) 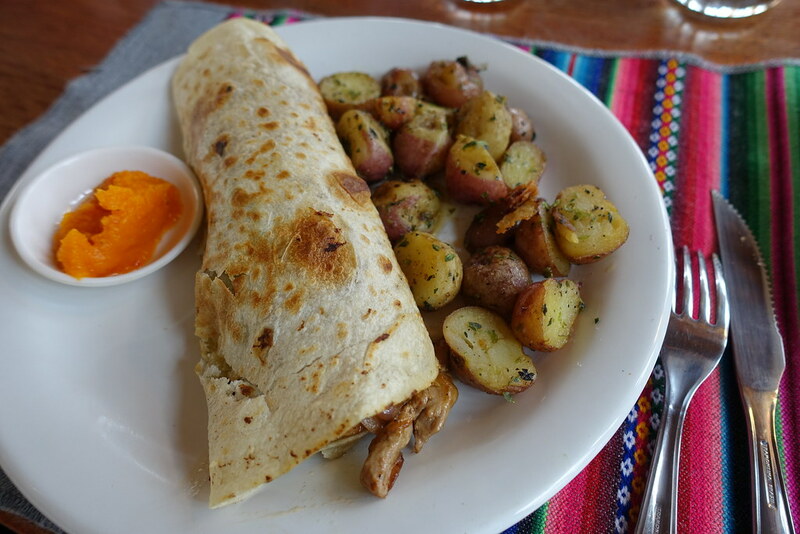 This comprised a beautifully fresh-tasting tomato soup, an incredible llama cheese wrap with roasted new potatoes (genuinely one of the tastiest things I’ve ever eaten) and a small pancake with chocolate sauce. 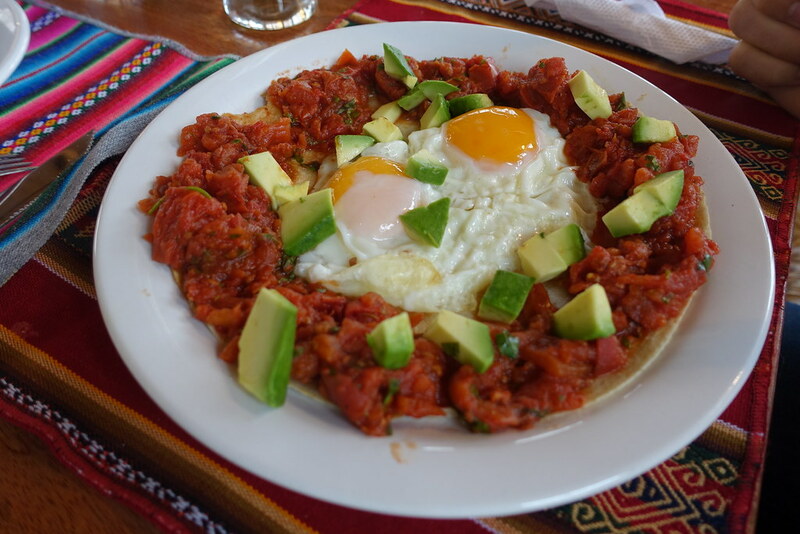 Steve ordered the huevos rancheros, and we both had fresh juices. We were so comfortable on our cushions beside the heater that we stayed for coffee and tea after that. Unfortunately, we accidentally stayed so long that we missed the start of the walking tour we’d planned to do. There was nothing left to do but wander the city ourselves, spending most time at the Witches Market. We bought hats, scarves and gloves in preparation for the even colder temperatures to come in Uyuni and the salt flats. Among all the llama-patterned knits spilling from every shop (I bought a red hat and gloves of this type) I was delighted to find a beautifully patterned, rainbow-coloured scarf, which became my best buy of the whole trip. Wet and cold, we half-heartedly went to look at some of the city’s most prominent landmarks, all churches, before starting to head back in the direction of our hotel. 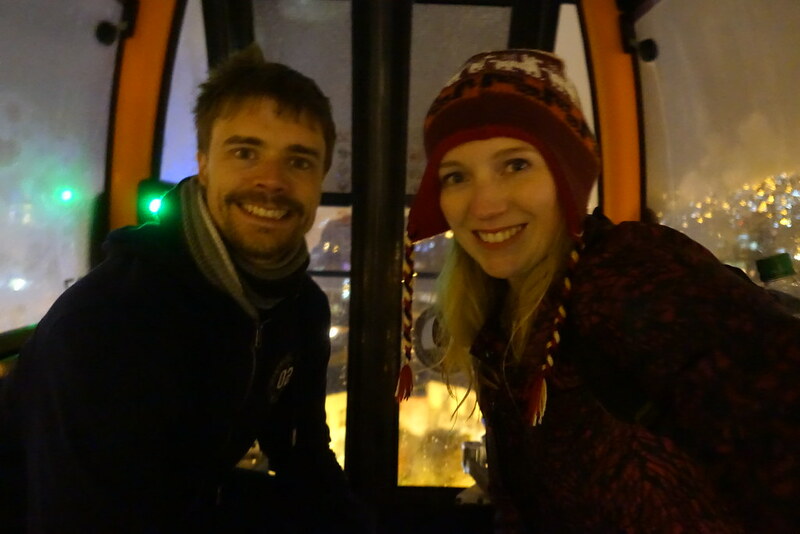 Now that darkness had fallen, we took one more trip in the cable car in an attempt to see the city at night… but the best we got was a wet blur of multicoloured lights. We admitted defeat and went to Hostal Perla Negra, where we tried to dry our clothes in the toilets before collecting our luggage and heading to the bus station. Boarding the Trans Omar overnight bus took a long time, and the bus itself seemed a little worse for wear. We had no seatbelts, no heating, and a constant stream of lively Bolivian music emanating from the drivers cabin, directly below us. But despite all this, I found the full-cama (fully reclining) seats so comfortable that I managed to sleep quite well. Sadly the same could not be said for Steve, who said afterwards he’d felt every swerve and bump, and heard some kind of argument that appeared to stop the bus for half an hour! In the early hours of the next day, we woke up in Uyuni. To be notified when the next post goes live, subscribe to this blog or like + follow Roam with Juliet on Facebook. 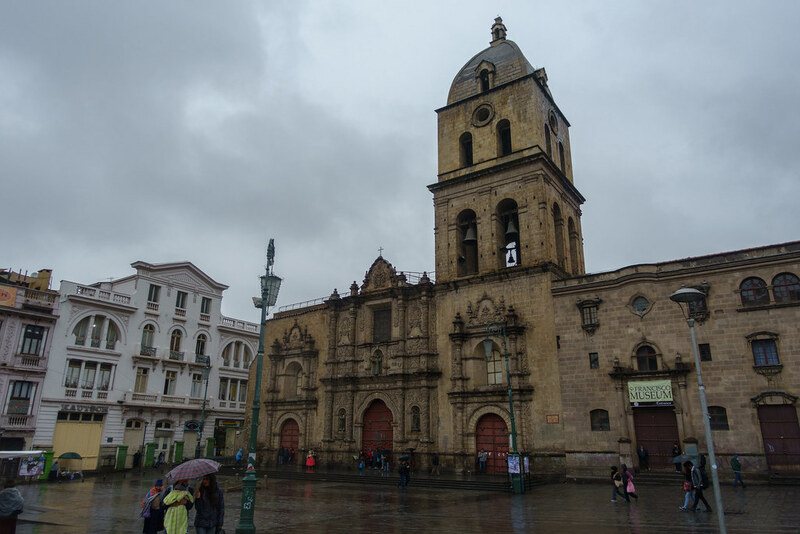 Posted in Bolivia, South America, TravelTagged bad weather, Jach'a Qhathu, markets, rain, The Carrot Tree, Trans OmarBookmark the permalink. We tried to! Thankfully this was only day we had bad weather the entire trip!